Hack squats, performed on a hack squat machine, derive their name from the machine's shoulder pads. "Hack" is a reference to the yoke placed around a draft animal's shoulders, notes strength training journalist Frederic Delavier in "Strength Training Anatomy." Hack squats primarily target the quadriceps muscles on the front of your thigh, as well as the gluteus maximus muscles of the buttocks. To perform a hack squat, step onto a hack squat machine and position your back against the machine's back rest. Place your shoulders under the padded shoulder rests, with your feet about shoulder-width apart on the foot plate. Slowly lower your hips, bending your knees to 90 degrees. Stand up again to return to the starting position. Keep your back in contact with the backrest throughout the movement to maintain support for your spine. 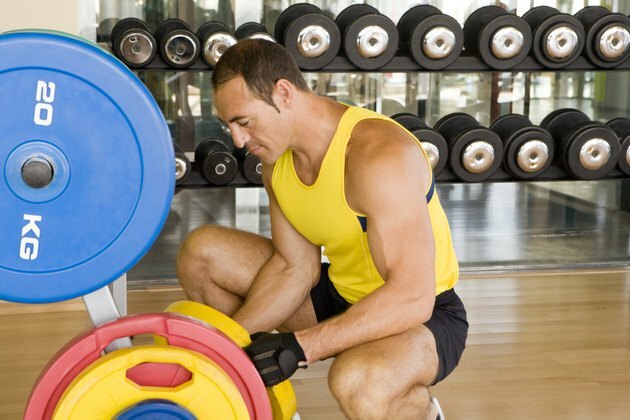 Hack squats target the quadriceps muscles, or quads, on the front of your thigh more than barbell squats do. The four quadriceps muscles attach to your thigh bone and the front of your pelvis and insert through a common tendon onto your knee cap, which attaches through the patellar ligament to the front of your shin bone. The quads are responsible for straightening your knee. Placing your feet toward the back of the foot plate will further emphasize the quadriceps contraction. Hack squats also work the gluteus maximus, the largest muscle of your buttocks. The gluteus maximus attaches to the back of the pelvis and the sacrum and inserts onto the back of the thigh bone, as well as into the iliotibial band, a thick tract of connective tissue on the outside of your thigh. The gluteus maximus extends, or straightens, the hip. Placing your feet closer to the front of the foot plate will place more emphasis on the gluteus maximus. Before using the hack squat machine, warm up your hips and legs with dynamic movements, such as body weight squats and lunges. To build strength, choose a weight that allows you to perform two to four sets of eight to 12 repetitions with good form. Increase the resistance as you get stronger. Rest two to three minutes between sets and wait at least 48 hours between strength training workouts. To stretch your quadriceps, stand and pull your right heel toward your right buttock with your right hand. Place your left hand on a wall or other support to maintain your balance. To increase the stretch, draw your knee back. Hold for 10 to 30 seconds, and repeat with your left leg.